A person looking out for a job may like to keep their options open and attend more than one interview. This may not always be the case for a person going for their first job interview. So if more than one interview goes successful, the person can have more than one job offer in their hand. So it is for the person to decide and they have to make a wise choice for it. Though it can be highly overwhelming at the start, there can be higher stakes involved. The choice of the particular job would make or break the career of an individual. While handling such a situation, the person may feel it being complicated and stressed out, but the best way to solve it would be to keep calm. And some things that the person can do, have been mentioned below. 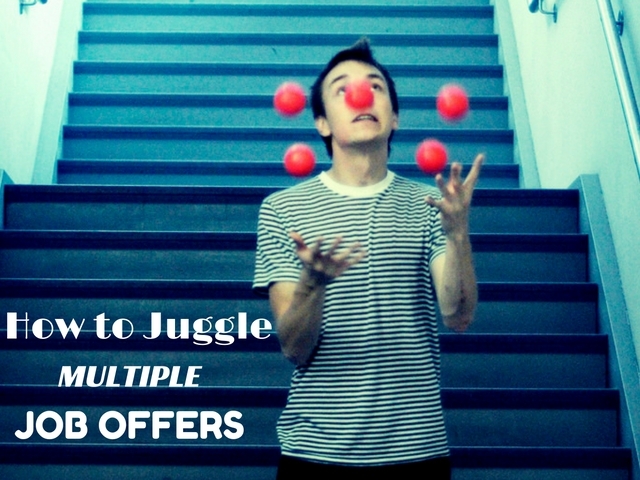 How to Handle Multiple Job Offers? Always know that any kind of offer verbally made isn’t a concrete offer. So before making a further move ahead, the person should know that they have an actual real offer letter in their hand. If there isn’t any written letter with the person, this can also give the person few more days to actually make up their mind where they wish to work. Also if the person expresses any interest in a job, then they must go to the company’s HR or recruiter and ask for a written offer if not yet given. There might not be enough written offer letters in the hands of the individual at the moment. Though they must be on their way for accepting a job, they may not have an official offer with them and though they have less leverage. But only when the person has a number of offers in their hand, they should begin their negotiation process. The best and most suitable option should be accepted by the person helping them in their life. The next thing that the person should do is to keep in their mind to review each and every detail in the job description before making up their mind. Certain important points need to be considered by them which have been mentioned below. Knowing the full job description in detail is very essential in making the best decision for the person. There might be a number of tasks that the person may be good at. For that very reason they must have applied for jobs which may not be similar to one another. So after the job offers have been presented then they need to read the job descriptions once again. Then after doing that they can come up with a decision beneficial for them. Above everything the person should have complete content towards the job they are doing. With that they will complete all their daily tasks efficiently in a proper order. Even though they are getting a high salary, doing a job which they are not satisfied by isn’t worth doing. So before accepting a job, the person should first ask themselves whether they really will enjoy using their skills for this particular job. After realizing this, only then will they realize whether there is satisfaction in the job. This particular concept can be spoken in two ways. From a number of job offers that a person has received, the job offering the highest salary will be much preferred by them. Sometimes the job having the highest salary may not provide complete job satisfaction. So before making a decision the person needs to know with this income what benefits they can have. And for the job the person is doing, they shouldn’t be underpaid for it as it will be a loss for them. Before accepting the job, if the person can know the behaviour or working of the employer or the boss it will be beneficial in their decision making. The person can think on things such as if the boss is a trustworthy person. Also they can see if the boss is willing to let the person work independently in the workplace in completing their tasks along with the monitoring of the boss. They can know this by asking those colleagues in the workplace whether this is the right boss. Every person would like to see a certain change in themselves while they are working for a certain job. So the person would like to see that they are progressing in their field of interest. If there are certain things like promotions involved then that job can be the first preference for the individual. So the person should look for things in the job profile such as how much will the average salary increase to or when can one get their deserving promotion etc. For travelling purposes to the workplace, location of the job plays a very important role. If the workplace is far away from the residential area of the person then the expenses will increase. If the workplace is nearer it will reduce the expenses of the person. Therefore, the more nearer the workplace is, the better it will suit the individual. So if the workplace is convenient for the person, they can go to work on time and so in turn it will not have a bad impression on their boss about them. Every company or an organization always has some specific objective or mission they would wish to reach. So it is advised that the person explores all the goals of the organization before they join it. When they start knowing that, they can know and understand the workplace in a better way. They will also start knowing whether they would want to work in this organization. If they are comfortable working in the workplace after knowing its goals they will work in a much better way. The culture of how the company’s daily functioning is very important for some people to know whether they have chosen the right workplace. After realizing the culture of the company, the person realizes whether their culture will blend in with the values of the company. It refers to things from the right clothes to be worn in the workplace to how the decision making process happens in the workplace. With this the person can understand whether the workplace is balanced well. Job security is becoming one of the most important factors in today’s economic conditions in the market. People are in danger of losing their jobs in this economy. If there is a decline in the industry, the person can lose their job and so their value will reduce. So before accepting a job, the person must ensure that there is job security on it. If a time arrives where there are declining economic conditions, then the person’s job and livelihood shouldn’t be at a threat. Every person who sees growth as their first option would like to be working in a workplace which has a lot of prestige. These people may also be thinking how they are viewed in the eyes of other people. So they would like to have some status to the job they are doing. So this can also be considered as an important point in the job decision making of the individual. With prestige of the job, the person can understand that they are heading in the right direction. Some companies or organizations offer bonus packages to their employees along with their salaries. This happens at the time of any major festive occasion or any achievement the organization has reached. So along with the job description, the person may also receive information on the bonus packages offered by the company from time to time. So they can make their decision on this basis also by choosing the company providing a decent salary and bigger bonus package than the other companies. An incentive pay is an additional pay which a company provides to their employees so that they are promoted to work harder and better for the company. It brings motivation in the employees. So a company may also provide long term incentives for their employees which will be mentioned in the job description. After understanding which company provides incentives which is long term, the person understands that it is beneficial for them and so they should take that job offer. For certain reasons, at times employees cannot make it to the workplace and hence would wish to communicate from their houses. This mainly would be for reasons relating to health problems or any other kind of emergency. So if the company doesn’t have a problem with the person taking a leave for one day and doing their work from their house it will really benefit the employee. So this is also one factor the person can look forward to whether or not they can communicate from their home. During the interview, there must have been a probability that the individual must have already met their possible future team mates. So they should start thinking towards those meetings whether the interaction happened appropriately or not. If their interactions and chemistry was good, then while working together they won’t have much of problems. So the individual while thinking of all the job offers they have received can also consider this factor. Appropriate working hours are very important for the person to know. Different places may have different working hours from time to time. Also they might consider travelling hours as a factor as to how much time they are spending outside their house. So after understanding that the working hours are appropriate enough, the person can make their decision. The company who has already given an offer letter to the individual wants the person in their company. But if the person hasn’t made up their mind just yet and they have to provide an answer then they can ask the company for some more time. Being honest and using such a technique can help the person in their professional career. When the person has some time in their hands, they know to think every aspect of the job in detail and then come to valid conclusion. When the person has time in their hand then they can move to this technique. Having time in hand, the person needs to alert the company in the right way at the right time. Firstly informing the company where the person wishes to work should be done first as the person should know whether or not the company still wants them. And alerting the other companies where the person doesn’t want to work should be done. At this moment, the job can still be in the hands of the person at least for that time if anything was to go wrong elsewhere. After the complete decision has been made there are going to be two winners and one loser. The candidate and the company he chooses after considering all the options will be the winners. The company that the person rejects will be the loser. So the person should be wise enough to thank everyone. This includes all the companies that presented the person with a job offer and also the ones which were rejected by the person. This shows that the person has handled this situation in a direct and elegant way showing professionalism. For some with multiple job offers juggling inside the head, making an appropriate and the right as well as wise decision is very important. This will help the person understanding their true potential and worth which can see them progress in their careers.